Former CFL quarterback and four-time Grey Cup Champion Damon Allen hosted his second annual High School Quarterback Challenge on December 6, 2012, at Downsview Park in Toronto, Ontario. The event featured quarterbacks from 100 different high schools in Ontario all competing for university scholarships to any post secondary school in Ontario and the chance to showcase their skills in front of the CFL Hall of Famer. The day was filled with music, entertainment, food and most importantly, football. Aside from the official Challenge, there was a youth Flag Football Tournament featuring several elementary schools all wearing jerseys highlighting Damon’s CFL career. The Tournament was sponsored by For KICKS, a youth development organization dedicated to leading at-risk youth down the right path through sports and athletics. Drum Lines from West Humber Collegiate, Father Henry Carr and Colborne Public School were all also in fine form as they presented numerous performances adding to the day’s excitement. The challenge began after the singing of the Canadian national anthem and a brief word from Damon Allen who was right by the quarterbacks throughout the course of the day, providing support and soaking in some upcoming talent, something he says is very important to touch base with. 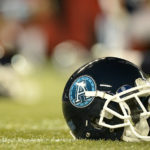 “I used to do the camp probably three to four years ago with the professionals and the corporates so I had the top quarterbacks in the Canadian Football League and we’d go through a little bit of a challenge, something very similar to this today. After I retired I started looking at the program more and kind of wondered how I could touch more quarterbacks, so I started looking at the grassroots level as far as high school quarterbacks and that’s where this basically came from,” explained Allen. “This is my 2nd year running it with the high school quarterbacks and we actually have intertwined education with the challenge and rewards giving the winners a partial university scholarship to any university in Ontario,” added the San Diego, California native. With the last two events now a success on multiple levels, Damon hopes to take his event across Canada in an effort to support and give more young quarterbacks a chance of a lifetime. “Our goal is to go national. We’re going to launch two more cities next year in British Columbia and Saskatchewan. We want it to go national, not only to showcase these kids’ skill level, but to also push them to a greater level of excellence which is really a good thing for young kids and young quarterbacks,” said the three-time Grey Cup MVP. Regarded as one of the best quarterbacks in CFL history, Damon Allen seemed to always find success with his high skill level and gritty determination to make a difference on the field and in the game’s most important moments. His same drive and determination is found in his desire to improve the quarterbacks of today while surrounding them with healthy competition. “I think one of the things this challenge is really good for is to have a healthy competition amongst these young men and their peers. When you’re competing against your peers it brings a level of excellence and a push to allow them to perform the way they want to. Their job is to go out there, have fun, showcase their skills and look at how they can get better, and so that’s what this whole competition is about,” elucidated Allen. Competition it was as the three groups of quarterbacks went through four different non-contact skill challenges testing their accuracy, strength, consistency and endurance. The groups would then be cut down to a top 9 where they would compete in a final two events to determine the winner. After a close finals, Hamilton JV Ironmen QB Liam Putt came out on top with a solid performance that started from his first throw. The Damon Allen High School Quarterback Challenge really emphasizes where dreams become reality and highlighted the importance of the grassroots level of sport in our community. There are so many excellent young athletes who have only respect for one another and it is truly refreshing to witness.